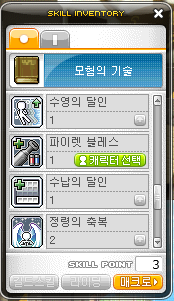 KMST v.1.2.384 ~ Cannon Shooter!!! A new pirate job came out to KMST!!! I already told you about the hints given here, and now it’s actually out! Animations and skill builds will come soon! What you need to know before I get into everything is what the job actually is. First off, I’d like to start with saying that it’s a PIRATE. Although you think it will be a gunslinger because it’s a cannon, and cannons are more closely related to gun, STR is the primary stat. Dex is the secondary. The whole job is based on your character’s Monkey. It’s very similar to Evans. Every skill is being done by the monkey. This job also uses a different weapon, a new weapon type called Cannons, which I’ll show as we go on. Since Nautilus Harbor was changed, they changed it again now! Click on the mini-maps to see the full map! Lastly, they start out as job ID “001”. Don’t worry about it, it’s almost the same as a normal beginner. Nothing special. Their advance’r is Kyrin, they’re real pirates! Another NPC that was added when they changed Nautilus Harbor is our very own Rising Star Valerie. They’re actually very useless… They’re just there for no reason. Lastly, they’re Adventurers. However, they do not share Cash Shop with Adventurers. They also cannot be made as Ultimate Explorers. And as you know how Nexon has been lately, they do not require bullets or anything. Description: Permanently improves the defense and attack of your cannon. Level 1: Attack +2, Physical Defense +25, Magic Defense +25. Level 2: Attack +4, Physical Defense +50, Magic Defense +50. Level 3: Attack +6, Physical Defense +75, Magic Defense +75. Level 4: Attack +8, Physical Defense +100, Magic Defense +100. Level 5: Attack +10, Physical Defense +125, Magic Defense +125. Level 6: Attack +12, Physical Defense +150, Magic Defense +150. Level 7: Attack +14, Physical Defense +175, Magic Defense +175. Level 8: Attack +16, Physical Defense +200, Magic Defense +200. Level 9: Attack +18, Physical Defense +225, Magic Defense +225. Level 10: Attack +20, Physical Defense +250, Magic Defense +250. Description: Launch flame attacks and attack up to 3 enemies. For a period of time, the enemy will suffer continuous damage. Level 1: MP Cost: 7, Damage: 187%, Attacks up to 3 monsters. Level 2: MP Cost: 7, Damage: 189%, Attacks up to 3 monsters. Level 3: MP Cost: 7, Damage: 191%, Attacks up to 3 monsters. Level 4: MP Cost: 7, Damage: 193%, Attacks up to 3 monsters. Level 5: MP Cost: 8, Damage: 195%, Attacks up to 3 monsters. Level 6: MP Cost: 8, Damage: 197%, Attacks up to 3 monsters. Level 7: MP Cost: 8, Damage: 199%, Attacks up to 3 monsters. Level 8: MP Cost: 8, Damage: 201%, Attacks up to 3 monsters. Level 9: MP Cost: 9, Damage: 203%, Attacks up to 3 monsters. Level 10: MP Cost: 9, Damage: 205%, Attacks up to 3 monsters. Level 11: MP Cost: 9, Damage: 207%, Attacks up to 3 monsters. Level 12: MP Cost: 9, Damage: 209%, Attacks up to 3 monsters. Level 13: MP Cost: 10, Damage: 211%, Attacks up to 3 monsters. Level 14: MP Cost: 10, Damage: 213%, Attacks up to 3 monsters. Level 15: MP Cost: 10, Damage: 215%, Attacks up to 3 monsters. Level 16: MP Cost: 10, Damage: 217%, Attacks up to 3 monsters. Level 17: MP Cost: 11, Damage: 219%, Attacks up to 3 monsters. Level 18: MP Cost: 11, Damage: 221%, Attacks up to 3 monsters. Level 19: MP Cost: 11, Damage: 223%, Attacks up to 3 monsters. Level 20: MP Cost: 11, Damage: 225%, Attacks up to 3 monsters. Description: Cannon can punch and knockback the neareast enemies. Level 1: MP Cost: 7, Damage: 76%, Attacks the enemy 3 times. Level 2: MP Cost: 7, Damage: 77%, Attacks the enemy 3 times. Level 3: MP Cost: 7, Damage: 78%, Attacks the enemy 3 times. Level 4: MP Cost: 7, Damage: 79%, Attacks the enemy 3 times. Level 5: MP Cost: 7, Damage: 80%, Attacks the enemy 3 times. Level 6: MP Cost: 7, Damage: 81%, Attacks the enemy 3 times. Level 7: MP Cost: 7, Damage: 82%, Attacks the enemy 3 times. Level 8: MP Cost: 7, Damage: 83%, Attacks the enemy 3 times. Level 9: MP Cost: 7, Damage: 84%, Attacks the enemy 3 times. Level 10: MP Cost: 7, Damage: 85%, Attacks the enemy 3 times. Level 11: MP Cost: 9, Damage: 86%, Attacks the enemy 3 times. Level 12: MP Cost: 9, Damage: 87%, Attacks the enemy 3 times. Level 13: MP Cost: 9, Damage: 88%, Attacks the enemy 3 times. Level 14: MP Cost: 9, Damage: 89%, Attacks the enemy 3 times. Level 15: MP Cost: 9, Damage: 90%, Attacks the enemy 3 times. Level 16: MP Cost: 9, Damage: 91%, Attacks the enemy 3 times. Level 17: MP Cost: 9, Damage: 92%, Attacks the enemy 3 times. Level 18: MP Cost: 9, Damage: 93%, Attacks the enemy 3 times. Level 19: MP Cost: 9, Damage: 94%, Attacks the enemy 3 times. Level 20: MP Cost: 9, Damage: 95%, Attacks the enemy 3 times. Description: During the state of emergency, avoid the enemy’s attack by firing your cannon backwards. Once attacked, there’s a chance that the enemy’s speed will be lowered. Level 1: MP Cost: 45, Damage: 154%, Attacks up to 3 monsters, 28% chance to slow down the enemy to -18 speed for 2 seconds. Level 2: MP Cost: 45, Damage: 158%, Attacks up to 3 monsters, 31% chance to slow down the enemy to -21 speed for 2 seconds. Level 3: MP Cost: 40, Damage: 162%, Attacks up to 3 monsters, 34% chance to slow down the enemy to -24 speed for 2 seconds. Level 4: MP Cost: 40, Damage: 166%, Attacks up to 3 monsters, 37% chance to slow down the enemy to -27 speed for 2 seconds. Level 5: MP Cost: 40, Damage: 170%, Attacks up to 3 monsters, 40% chance to slow down the enemy to -30 speed for 3 seconds. Level 6: MP Cost: 35, Damage: 174%, Attacks up to 3 monsters, 43% chance to slow down the enemy to -33 speed for 3 seconds. Level 7: MP Cost: 35, Damage: 178%, Attacks up to 3 monsters, 46% chance to slow down the enemy to -36 speed for 3 seconds. Level 8: MP Cost: 35, Damage: 182%, Attacks up to 3 monsters, 49% chance to slow down the enemy to -39 speed for 3 seconds. Level 9: MP Cost: 30, Damage: 186%, Attacks up to 3 monsters, 52% chance to slow down the enemy to -42 speed for 3 seconds. Level 10: MP Cost: 30, Damage: 190%, Attacks up to 3 monsters, 55% chance to slow down the enemy to -45 speed for 4 seconds. Level 11: MP Cost: 30, Damage: 194%, Attacks up to 3 monsters, 58% chance to slow down the enemy to -48 speed for 4 seconds. Level 12: MP Cost: 25, Damage: 198%, Attacks up to 3 monsters, 61% chance to slow down the enemy to -51 speed for 4 seconds. Level 13: MP Cost: 25, Damage: 202%, Attacks up to 3 monsters, 64% chance to slow down the enemy to -54 speed for 4 seconds. Level 14: MP Cost: 25, Damage: 206%, Attacks up to 3 monsters, 67% chance to slow down the enemy to -57 speed for 4 seconds. Level 15: MP Cost: 20, Damage: 210%, Attacks up to 3 monsters, 70% chance to slow down the enemy to -60 speed for 5 seconds. Explanation: We first max Cannon Splash because it’s your only mobbing skill in 1st job. After that we’ll max Gigantic Backstab to add some gunslinger Recoil Shot action to your Cannon Shooter that will be strong, fun, and MP affordable. Next is Build Up Cannon to add attack and a whole lot of DEF which is great and necessary for your Cannon Shooter. The last skill that we dump our skill points into is Punching Cannon, which is not really useful anyway since it attacks only one monster and soon enough will be replaced. Description: Permanently increases your critical rate and critical minimum damage. Level 1: Critical Rate +6%, Minimum Critical Damage +6%. Level 2: Critical Rate +7%, Minimum Critical Damage +6%. Level 3: Critical Rate +8%, Minimum Critical Damage +6%. Level 4: Critical Rate +9%, Minimum Critical Damage +7%. Level 5: Critical Rate +10%, Minimum Critical Damage +7%. Level 6: Critical Rate +11%, Minimum Critical Damage +7%. Level 7: Critical Rate +12%, Minimum Critical Damage +8%. Level 8: Critical Rate +13%, Minimum Critical Damage +8%. Level 9: Critical Rate +14%, Minimum Critical Damage +8%. Level 10: Critical Rate +15%, Minimum Critical Damage +9%. Level 11: Critical Damage +16%, Minimum Critical Damage +9%. Level 12: Critical Damage +17%, Minimum Critical Damage +9%. Level 13: Critical Damage +18%, Minimum Critical Damage +10%. Level 14: Critical Damage +19%, Minimum Critical Damage +10%. Level 15: Critical Damage +20%, Minimum Critical Damage +10%. Description: Increases the cannon mastery and accuracy. Level 1: Cannon Mastery +12%, Accuracy +6. Level 2: Cannon Mastery +14%, Accuracy +12. Level 3: Cannon Mastery +16%, Accuracy +18. Level 4: Cannon Mastery +18%, Accuracy +24. Level 5: Cannon Mastery +20%, Accuracy +30. Level 6: Cannon Mastery +22%, Accuracy +36. Level 7: Cannon Mastery +24%, Accuracy +42. Level 8: Cannon Mastery +26%, Accuracy +48. Level 9: Cannon Mastery +28%, Accuracy +54. Level 10: Cannon Mastery +30%, Accuracy +60. Level 11: Cannon Mastery +32%, Accuracy +66. Level 12: Cannon Mastery +34%, Accuracy +72. Level 13: Cannon Mastery +36%, Accuracy +78. Level 14: Cannon Mastery +38%, Accuracy +84. Level 15: Cannon Mastery +40%, Accuracy +90. Level 16: Cannon Mastery +42%, Accuracy +96. Level 17: Cannon Mastery +44%, Accuracy +102. Level 18: Cannon Mastery +46%, Accuracy +108. Level 19: Cannon Mastery +48%, Accuracy +114. Level 20: Cannon Mastery +50%, Accuracy +120. Description: Follow the pirates’ secret training to improve strength and dexterity. Description: Fires a small number of shells at the same time for several feet to attack the enemies. Level 1: MP Cost: 16, Damage: 163%, Attacks up to 4 monsters 2 times. Level 2: MP Cost: 16, Damage: 166%, Attacks up to 4 monsters 2 times. Level 3: MP Cost: 16, Damage: 169%, Attacks up to 4 monsters 2 times. Level 4: MP Cost: 16, Damage: 172%, Attacks up to 4 monsters 2 times. Level 5: MP Cost: 18, Damage: 175%, Attacks up to 4 monsters 2 times. Level 6: MP Cost: 18, Damage: 178%, Attacks up to 4 monsters 2 times. Level 7: MP Cost: 18, Damage: 181%, Attacks up to 4 monsters 2 times. Level 8: MP Cost: 18, Damage: 184%, Attacks up to 4 monsters 2 times. Level 9: MP Cost: 18, Damage: 187%, Attacks up to 4 monsters 2 times. Level 10: MP Cost: 20, Damage: 190%, Attacks up to 4 monsters 2 times. Level 11: MP Cost: 20, Damage: 193%, Attacks up to 4 monsters 2 times. Level 12: MP Cost: 20, Damage: 196%, Attacks up to 4 monsters 2 times. Level 13: MP Cost: 20, Damage: 199%, Attacks up to 4 monsters 2 times. Level 14: MP Cost: 20, Damage: 202%, Attacks up to 4 monsters 2 times. Level 15: MP Cost: 22, Damage: 205%, Attacks up to 4 monsters 2 times. Level 16: MP Cost: 22, Damage: 208%, Attacks up to 4 monsters 2 times. Level 17: MP Cost: 22, Damage: 211%, Attacks up to 4 monsters 2 times. Level 18: MP Cost: 22, Damage: 214%, Attacks up to 4 monsters 2 times. Level 19: MP Cost: 22, Damage: 217%, Attacks up to 4 monsters 2 times. Level 20: MP Cost: 24, Damage: 220%, Attacks up to 4 monsters 2 times. Description: Roll the bomb-filled barrels. Barrels will explode the enemies and push them a certain distance. Level 1: MP Cost: 20, Damage: 31%, Attacks up to 8 monsters 3 times, 50% chance to knockback your enemy, Push the monsters and deal 243% damage once it explodes. Level 2: MP Cost: 20, Damage: 32%, Attacks up to 8 monsters 3 times, 55% chance to knockback your enemy, Push the monsters and deal 246% damage once it explodes. Level 3: MP Cost: 20, Damage: 33%, Attacks up to 8 monsters 3 times, 55% chance to knockback your enemy, Push the monsters and deal 249% damage once it explodes. Level 4: MP Cost: 20, Damage: 34%, Attacks up to 8 monsters 3 times, 60% chance to knockback your enemy, Push the monsters and deal 252% damage once it explodes. Level 5: MP Cost: 22, Damage: 35%, Attacks up to 8 monsters 3 times, 60% chance to knockback your enemy, Push the monsters and deal 255% damage once it explodes. Level 6: MP Cost: 22, Damage: 36%, Attacks up to 8 monsters 3 times, 65% chance to knockback your enemy, Push the monsters and deal 258% damage once it explodes. Level 7: MP Cost: 22, Damage: 37%, Attacks up to 8 monsters 3 times, 65% chance to knockback your enemy, Push the monsters and deal 261% damage once it explodes. Level 8: MP Cost: 22, Damage: 38%, Attacks up to 8 monsters 3 times, 70% chance to knockback your enemy, Push the monsters and deal 264% damage once it explodes. Level 9: MP Cost: 22, Damage: 39%, Attacks up to 8 monsters 3 times, 70% chance to knockback your enemy, Push the monsters and deal 267% damage once it explodes. Level 10: MP Cost: 24, Damage: 40%, Attacks up to 8 monsters 3 times, 75% chance to knockback your enemy, Push the monsters and deal 270% damage once it explodes. Level 11: MP Cost: 24, Damage: 41%, Attacks up to 8 monsters 3 times, 75% chance to knockback your enemy, Push the monsters and deal 273% damage once it explodes. Level 12: MP Cost: 24, Damage: 42%, Attacks up to 8 monsters 3 times, 80% chance to knockback your enemy, Push the monsters and deal 276% damage once it explodes. Level 13: MP Cost: 24, Damage: 43%, Attacks up to 8 monsters 3 times, 80% chance to knockback your enemy, Push the monsters and deal 279% damage once it explodes. Level 14: MP Cost: 24, Damage: 44%, Attacks up to 8 monsters 3 times, 85% chance to knockback your enemy, Push the monsters and deal 282% damage once it explodes. Level 15: MP Cost: 26, Damage: 45%, Attacks up to 8 monsters 3 times, 85% chance to knockback your enemy, Push the monsters and deal 285% damage once it explodes. Level 16: MP Cost: 26, Damage: 46%, Attacks up to 8 monsters 3 times, 90% chance to knockback your enemy, Push the monsters and deal 288% damage once it explodes. Level 17: MP Cost: 26, Damage: 47%, Attacks up to 8 monsters 3 times, 90% chance to knockback your enemy, Push the monsters and deal 291% damage once it explodes. Level 18: MP Cost: 26, Damage: 48%, Attacks up to 8 monsters 3 times, 95% chance to knockback your enemy, Push the monsters and deal 294% damage once it explodes. Level 19: MP Cost: 26, Damage: 49%, Attacks up to 8 monsters 3 times, 95% chance to knockback your enemy, Push the monsters and deal 297% damage once it explodes. Level 20: MP Cost: 28, Damage: 50%, Attacks up to 8 monsters 3 times, 100% chance to knockback your enemy, Push the monsters and deal 300% damage once it explodes. Description: Use MP to double the attack speed of your cannon. Must have a cannon equipped. Description: Use your monkey’s magic to increase your party members’ HP, MP, all stats, speed, jump, accuracy, and avoidability for a short period of time. This buff can be used with any other buffs. Level 1: MP Cost: 30, Duration: 15 seconds, MaxHP +15, MaxMP +15, All Stats +1, Speed +1, Jump +1, Accuracy +8, Avoidability +8. Level 2: MP Cost: 30, Duration: 30 seconds, MaxHP +30, MaxMP +30, All Stats +2, Speed +1, Jump +1, Accuracy +16, Avoidability +16. Level 3: MP Cost: 30, Duration: 45 seconds, MaxHP +45, MaxMP +45, All Stats +3, Speed +2, Jump +1, Accuracy +24, Avoidability +24. Level 4: MP Cost: 35, Duration: 60 seconds, MaxHP +60, MaxMP +60, All Stats +4, Speed +2, Jump +1, Accuracy +32, Avoidability +32. Level 5: MP Cost: 35, Duration: 75 seconds, MaxHP +75, MaxMP +75, All Stats +5, Speed +3, Jump +2, Accuracy +40, Avoidability +40. Level 6: MP Cost: 35, Duration: 90 seconds, MaxHP +90, MaxMP +90, All Stats +6, Speed +3, Jump +2, Accuracy +48, Avoidability +48. Level 7: MP Cost: 35, Duration: 105 seconds, MaxHP +105, MaxMP +105, All Stats +7, Speed +4, Jump +2, Accuracy +56, Avoidability +56. Level 8: MP Cost: 40, Duration: 120 seconds, MaxHP +120, MaxMP +120, All Stats +8, Speed +4, Jump +2, Accuracy +64, Avoidability +64. Level 9: MP Cost: 40, Duration: 135 seconds, MaxHP +135, MaxMP +135, All Stats +9, Speed +5, Jump +3, Accuracy +72, Avoidability +72. Level 10: MP Cost: 40, Duration: 150 seconds, MaxHP +150, MaxMP +150, All Stats +10, Speed +5, Jump +3, Accuracy +80, Avoidability +80. Level 11: MP Cost: 40, Duration: 165 seconds, MaxHP +165, MaxMP +165, All Stats +11, Speed +6, Jump +3, Accuracy +88, Avoidability +88. Level 12: MP Cost: 45, Duration: 180 seconds, MaxHP +180, MaxMP +180, All Stats +12, Speed +6, Jump +3, Accuracy +96, Avoidability +96. Level 13: MP Cost: 45, Duration: 195 seconds, MaxHP +195, MaxMP +195, All Stats +13, Speed +7, Jump +4, Accuracy +104, Avoidability +104. Level 14: MP Cost: 45, Duration: 210 seconds, MaxHP +210, MaxMP +210, All Stats +14, Speed +7, Jump +4, Accuracy +112, Avoidability +112. Level 15: MP Cost: 45, Duration: 225 seconds, MaxHP +225, MaxMP +225, All Stats +15, Speed +8, Jump +4, Accuracy +120, Avoidability +120. Level 16: MP Cost: 50, Duration: 240 seconds, MaxHP +240, MaxMP +240, All Stats +16, Speed +8, Jump +4, Accuracy +128, Avoidability +128. Level 17: MP Cost: 50, Duration: 255 seconds, MaxHP +255, MaxMP +255, All Stats +17, Speed +9, Jump +5, Accuracy +136, Avoidability +136. Level 18: MP Cost: 50, Duration: 270 seconds, MaxHP +270, MaxMP +270, All Stats +18, Speed +9, Jump +5, Accuracy +144, Avoidability +144. Level 19: MP Cost: 50, Duration: 285 seconds, MaxHP +285, MaxMP +285, All Stats +19, Speed +10, Jump +5, Accuracy +152, Avoidability +152. Level 20: MP Cost: 55, Duration: 300 seconds, MaxHP +300, MaxMP +300, All Stats +20, Speed +10, Jump +5, Accuracy +160, Avoidability +160. Explanation: The first thing we do is max Monkey Boom Rush, your best mobbing skill. Since I know that most of you are DEX-less (which I highly recommend by the way), we max Pirate Training. The 30 DEX bonus should be good till 50 (even with no DEX bonuses, 4 DEX base +19 from Pirate Blessing +30 from Pirate Training = 53 DEX! Your DEX has to equal your level so it’s the amount for level 53). We then get 5 on Cannon Mastery so we can put SP into Cannon Booster. We put 6 into Cannon Booser so the buff lasts for 1 minute. After that we max Critical Fire to increase your critical rate. Once that’s all done, you should be level 49 and therefore slowly approaching your ‘PQ’ing era,’ and a party buff is needed! It’s also needed since you’re approaching level 53, and more DEX is needed. Therefore, we put SP into Monkey Magic, your only party skill, and we max it so you can get 20 DEX and enough DEX till level 73. We max Cannon Mastery to improve your overall performance and then Cannon Booster so you don’t have to rebuff as much. Last thing we do is dump our SP into Slug Shot. Slug Shot is not a very good mobbing skill, Monkey Boom Rush is still better. There’s no need to max Slug Shot. Description: Permanently enforces the damage and attack speed of your cannon. Level 1: Permanently increases your damage by 2, Attack speed increased by 1. Level 2: Permanently increases your damage by 4, Attack speed increased by 1. Level 3: Permanently increases your damage by 6, Attack speed increased by 1. Level 4: Permanently increases your damage by 8, Attack speed increased by 1. Level 5: Permanently increases your damage by 10, Attack speed increased by 1. Level 6: Permanently increases your damage by 12, Attack speed increased by 1. Level 7: Permanently increases your damage by 14, Attack speed increased by 1. Level 8: Permanently increases your damage by 16, Attack speed increased by 1. Level 9: Permanently increases your damage by 18, Attack speed increased by 1. Level 10: Permanently increases your damage by 20, Attack speed increased by 1. Level 11: Permanently increases your damage by 22, Attack speed increased by 1. Level 12: Permanently increases your damage by 24, Attack speed increased by 1. Level 13: Permanently increases your damage by 26, Attack speed increased by 1. Level 14: Permanently increases your damage by 28, Attack speed increased by 1. Level 15: Permanently increases your damage by 30, Attack speed increased by 1. Description: Permanently enhances your cannon. Level 1: MaxHP: +1%, Weapon DEF: +12%, Abnormal Status Resistance: +1%. Level 2: MaxHP: +2%, Weapon DEF: +14%, Abnormal Status Resistance: +2%. Level 3: MaxHP: +3%, Weapon DEF: +16%, Abnormal Status Resistance: +3%. Level 4: MaxHP: +4%, Weapon DEF: +18%, Abnormal Status Resistance: +4%. Level 5: MaxHP: +5%, Weapon DEF: +20%, Abnormal Status Resistance: +5%. Level 6: MaxHP: +6%, Weapon DEF: +22%, Abnormal Status Resistance: +6%. Level 7: MaxHP: +7%, Weapon DEF: +24%, Abnormal Status Resistance: +7%. Level 8: MaxHP: +8%, Weapon DEF: +26%, Abnormal Status Resistance: +8%. Level 9: MaxHP: +9%, Weapon DEF: +28%, Abnormal Status Resistance: +9%. Level 10: MaxHP: +10%, Weapon DEF: +30%, Abnormal Status Resistance: +10%. Level 11: MaxHP: +11%, Weapon DEF: +32%, Abnormal Status Resistance: +11%. Level 12: MaxHP: +12%, Weapon DEF: +34%, Abnormal Status Resistance: +12%. Level 13: MaxHP: +13%, Weapon DEF: +36%, Abnormal Status Resistance: +13%. Level 14: MaxHP: +14%, Weapon DEF: +38%, Abnormal Status Resistance: +14%. Level 15: MaxHP: +15%, Weapon DEF: +40%, Abnormal Status Resistance: +15%. Level 16: MaxHP: +16%, Weapon DEF: +42%, Abnormal Status Resistance: +16%. Level 17: MaxHP: +17%, Weapon DEF: +44%, Abnormal Status Resistance: +17%. Level 18: MaxHP: +18%, Weapon DEF: +46%, Abnormal Status Resistance: +18%. Level 19: MaxHP: +19%, Weapon DEF: +48%, Abnormal Status Resistance: +19%. Level 20: MaxHP: +20%, Weapon DEF: +50%, Abnormal Status Resistance: +20%. Description: Grants a chance to deal additional damage after an attack. Level 1: Proc Rate: 6%, Damage: 104%. Level 2: Proc Rate: 7%, Damage: 108%. Level 3: Proc Rate: 8%, Damage: 112%. Level 4: Proc Rate: 9%, Damage: 116%. Level 5: Proc Rate: 10%, Damage: 120%. Level 6: Proc Rate: 11%, Damage: 124%. Level 7: Proc Rate: 12%, Damage: 128%. Level 8: Proc Rate: 13%, Damage: 132%. Level 9: Proc Rate: 14%, Damage: 136%. Level 10: Proc Rate: 15%, Damage: 140%. Level 11: Proc Rate: 16%, Damage: 144%. Level 12: Proc Rate: 17%, Damage: 148%. Level 13: Proc Rate: 18%, Damage: 152%. Level 14: Proc Rate: 19%, Damage: 156%. Level 15: Proc Rate: 20%, Damage: 160%. Description: Point your cannon at your enemies and a shell will be fired to attack them. Level 1: MP Cost: 28, Damage: 222%, Attacks up to 6 monsters 3 times. Level 2: MP Cost: 28, Damage: 224%, Attacks up to 6 monsters 3 times. Level 3: MP Cost: 28, Damage: 226%, Attacks up to 6 monsters 3 times. Level 4: MP Cost: 28, Damage: 228%, Attacks up to 6 monsters 3 times. Level 5: MP Cost: 30, Damage: 230%, Attacks up to 6 monsters 3 times. Level 6: MP Cost: 30, Damage: 232%, Attacks up to 6 monsters 3 times. Level 7: MP Cost: 30, Damage: 234%, Attacks up to 6 monsters 3 times. Level 8: MP Cost: 30, Damage: 236%, Attacks up to 6 monsters 3 times. Level 9: MP Cost: 30, Damage: 238%, Attacks up to 6 monsters 3 times. Level 10: MP Cost: 32, Damage: 240%, Attacks up to 6 monsters 3 times. Level 11: MP Cost: 32, Damage: 242%, Attacks up to 6 monsters 3 times. Level 12: MP Cost: 32, Damage: 244%, Attacks up to 6 monsters 3 times. Level 13: MP Cost: 32, Damage: 246%, Attacks up to 6 monsters 3 times. Level 14: MP Cost: 32, Damage: 248%, Attacks up to 6 monsters 3 times. Level 15: MP Cost: 34, Damage: 250%, Attacks up to 6 monsters 3 times. Level 16: MP Cost: 34, Damage: 252%, Attacks up to 6 monsters 3 times. Level 17: MP Cost: 34, Damage: 254%, Attacks up to 6 monsters 3 times. Level 18: MP Cost: 34, Damage: 256%, Attacks up to 6 monsters 3 times. Level 19: MP Cost: 34, Damage: 258%, Attacks up to 6 monsters 3 times. Level 20: MP Cost: 36, Damage: 260%, Attacks up to 6 monsters 3 times. Description: Plant a special bomb that will attack many enemies at the same time and stun them for a short period of time. In addition, the damage of Monkey Boom Rush will permanently increase. Level 1: Active Effects: MP Cost: 30, Damage: 223%, Attacks up to 10 monsters 5 time, 45% chance to stun the enemy for 2 seconds, Cooldown: 5 seconds. Passive Effects: Permanently increases the damage of Monkey Boom Rush by 3%. Level 2: Active Effects: MP Cost: 30, Damage: 226%, Attacks up to 10 monsters 5 time, 50% chance to stun the enemy for 2 seconds, Cooldown: 5 seconds. Level 3: Active Effects: MP Cost: 30, Damage: 229%, Attacks up to 10 monsters 5 time, 50% chance to stun the enemy for 2 seconds, Cooldown: 5 seconds. Passive Effects: Permanently increases the damage of Monkey Boom Rush by 6%. Level 4: Active Effects: MP Cost: 30, Damage: 232%, Attacks up to 10 monsters 5 time, 55% chance to stun the enemy for 2 seconds, Cooldown: 5 seconds. Level 5: Active Effects: MP Cost: 34, Damage: 235%, Attacks up to 10 monsters 5 time, 55% chance to stun the enemy for 2 seconds, Cooldown: 5 seconds. Passive Effects: Permanently increases the damage of Monkey Boom Rush by 9%. Level 6: Active Effects: MP Cost: 34, Damage: 238%, Attacks up to 10 monsters 5 time, 60% chance to stun the enemy for 2 seconds, Cooldown: 5 seconds. Level 7: Active Effects: MP Cost: 34, Damage: 241%, Attacks up to 10 monsters 5 time, 60% chance to stun the enemy for 2 seconds, Cooldown: 5 seconds. Passive Effects: Permanently increases the damage of Monkey Boom Rush by 12%. Level 8: Active Effects: MP Cost: 34, Damage: 244%, Attacks up to 10 monsters 5 time, 65% chance to stun the enemy for 2 seconds, Cooldown: 5 seconds. Level 9: Active Effects: MP Cost: 34, Damage: 247%, Attacks up to 10 monsters 5 time, 65% chance to stun the enemy for 2 seconds, Cooldown: 5 seconds. Passive Effects: Permanently increases the damage of Monkey Boom Rush by 15%. Level 10: Active Effects: MP Cost: 38, Damage: 250%, Attacks up to 10 monsters 5 time, 70% chance to stun the enemy for 3 seconds, Cooldown: 5 seconds. Level 11: Active Effects: MP Cost: 38, Damage: 253%, Attacks up to 10 monsters 5 time, 70% chance to stun the enemy for 3 seconds, Cooldown: 5 seconds. Passive Effects: Permanently increases the damage of Monkey Boom Rush by 18%. Level 12: Active Effects: MP Cost: 38, Damage: 256%, Attacks up to 10 monsters 5 time, 75% chance to stun the enemy for 3 seconds, Cooldown: 5 seconds. Level 13: Active Effects: MP Cost: 38, Damage: 259%, Attacks up to 10 monsters 5 time, 75% chance to stun the enemy for 3 seconds, Cooldown: 5 seconds. Passive Effects: Permanently increases the damage of Monkey Boom Rush by 21%. Level 14: Active Effects: MP Cost: 38, Damage: 262%, Attacks up to 10 monsters 5 time, 80% chance to stun the enemy for 3 seconds, Cooldown: 5 seconds. Level 15: Active Effects: MP Cost: 42, Damage: 265%, Attacks up to 10 monsters 5 time, 80% chance to stun the enemy for 3 seconds, Cooldown: 5 seconds. Passive Effects: Permanently increases the damage of Monkey Boom Rush by 24%. Level 16: Active Effects: MP Cost: 42, Damage: 268%, Attacks up to 10 monsters 5 time, 85% chance to stun the enemy for 3 seconds, Cooldown: 5 seconds. Level 17: Active Effects: MP Cost: 42, Damage: 271%, Attacks up to 10 monsters 5 time, 85% chance to stun the enemy for 3 seconds, Cooldown: 5 seconds. Passive Effects: Permanently increases the damage of Monkey Boom Rush by 27%. Level 18: Active Effects: MP Cost: 42, Damage: 274%, Attacks up to 10 monsters 5 time, 90% chance to stun the enemy for 3 seconds, Cooldown: 5 seconds. Level 19: Active Effects: MP Cost: 42, Damage: 277%, Attacks up to 10 monsters 5 time, 90% chance to stun the enemy for 3 seconds, Cooldown: 5 seconds. Passive Effects: Permanently increases the damage of Monkey Boom Rush by 30%. Level 20: Active Effects: MP Cost: 46, Damage: 280%, Attacks up to 10 monsters 5 time, 95% chance to stun the enemy for 4 seconds, Cooldown: 5 seconds. Description: Get your monkey’s noise up and attack surrounding enemies. As you collect power, your monkey will be able to create a big noise that will be heard for a wide range, and if the maximum possible output is done, there’s a chance to hit a critical attack. Level 1: MP Cost: 35, Damage: 620%, 45% chance to stun, 2% chance to hit a critical attack when the maximum possible output is done. Level 2: MP Cost: 35, Damage: 640%, 50% chance to stun, 2% chance to hit a critical attack when the maximum possible output is done. Level 3: MP Cost: 35, Damage: 660%, 50% chance to stun, 4% chance to hit a critical attack when the maximum possible output is done. Level 4: MP Cost: 35, Damage: 680%, 55% chance to stun, 4% chance to hit a critical attack when the maximum possible output is done. Level 5: MP Cost: 40, Damage: 700%, 55% chance to stun, 6% chance to hit a critical attack when the maximum possible output is done. Level 6: MP Cost: 40, Damage: 720%, 60% chance to stun, 6% chance to hit a critical attack when the maximum possible output is done. Level 7: MP Cost: 40, Damage: 740%, 60% chance to stun, 8% chance to hit a critical attack when the maximum possible output is done. Level 8: MP Cost: 40, Damage: 760%, 65% chance to stun, 8% chance to hit a critical attack when the maximum possible output is done. Level 9: MP Cost: 40, Damage: 780%, 65% chance to stun, 10% chance to hit a critical attack when the maximum possible output is done. Level 10: MP Cost: 45, Damage: 800%, 70% chance to stun, 10% chance to hit a critical attack when the maximum possible output is done. Level 11: MP Cost: 45, Damage: 820%, 70% chance to stun, 12% chance to hit a critical attack when the maximum possible output is done. Level 12: MP Cost: 45, Damage: 840%, 75% chance to stun, 12% chance to hit a critical attack when the maximum possible output is done. Level 13: MP Cost: 45, Damage: 860%, 75% chance to stun, 14% chance to hit a critical attack when the maximum possible output is done. Level 14: MP Cost: 45, Damage: 880%, 80% chance to stun, 14% chance to hit a critical attack when the maximum possible output is done. Level 15: MP Cost: 50, Damage: 900%, 80% chance to stun, 16% chance to hit a critical attack when the maximum possible output is done. Level 16: MP Cost: 50, Damage: 920%, 85% chance to stun, 16% chance to hit a critical attack when the maximum possible output is done. Level 17: MP Cost: 50, Damage: 940%, 85% chance to stun, 18% chance to hit a critical attack when the maximum possible output is done. Level 18: MP Cost: 50, Damage: 960%, 90% chance to stun, 18% chance to hit a critical attack when the maximum possible output is done. Level 19: MP Cost: 50, Damage: 980%, 90% chance to stun, 20% chance to hit a critical attack when the maximum possible output is done. Level 20: MP Cost: 55, Damage: 1000%, 95% chance to stun, 20% chance to hit a critical attack when the maximum possible output is done. Description: Launch your cannon from the ground and jump high and recoil. Jumping off the ground also damages the enemy. Level 1: MP Cost: 60, Damage: 168%, Jumps over a maximum of 6 monsters and damages them. Level 2: MP Cost: 60, Damage: 171%, Jumps over a maximum of 6 monsters and damages them. Level 3: MP Cost: 55, Damage: 174%, Jumps over a maximum of 6 monsters and damages them. Level 4: MP Cost: 55, Damage: 177%, Jumps over a maximum of 6 monsters and damages them. Level 5: MP Cost: 55, Damage: 180%, Jumps over a maximum of 6 monsters and damages them. Level 6: MP Cost: 50, Damage: 183%, Jumps over a maximum of 6 monsters and damages them. Level 7: MP Cost: 50, Damage: 186%, Jumps over a maximum of 6 monsters and damages them. Level 8: MP Cost: 50, Damage: 189%, Jumps over a maximum of 6 monsters and damages them. Level 9: MP Cost: 45, Damage: 192%, Jumps over a maximum of 6 monsters and damages them. Level 10: MP Cost: 45, Damage: 195%, Jumps over a maximum of 6 monsters and damages them. Level 11: MP Cost: 45, Damage: 198%, Jumps over a maximum of 6 monsters and damages them. Level 12: MP Cost: 40, Damage: 201%, Jumps over a maximum of 6 monsters and damages them. Level 13: MP Cost: 40, Damage: 204%, Jumps over a maximum of 6 monsters and damages them. Level 14: MP Cost: 40, Damage: 207%, Jumps over a maximum of 6 monsters and damages them. Level 15: MP Cost: 35, Damage: 210%, Jumps over a maximum of 6 monsters and damages them. Description: Detonate oak barrels and get a random buff. The buffs have a chance to curse your enemy for a short period of time. Level 1: MP Cost: 35, Buff Duration: 186 seconds. Has a 3% chance to curse your enemies with darkness, stun, freeze, or slow for 3 seconds. Level 2: MP Cost: 40, Buff Duration: 192 seconds. Has a 6% chance to curse your enemies with darkness, stun, freeze, or slow for 3 seconds. Level 3: MP Cost: 40, Buff Duration: 198 seconds. Has a 9% chance to curse your enemies with darkness, stun, freeze, or slow for 3 seconds. Level 4: MP Cost: 45, Buff Duration: 204 seconds. Has a 12% chance to curse your enemies with darkness, stun, freeze, or slow for 3 seconds. Level 5: MP Cost: 45, Buff Duration: 210 seconds. Has a 15% chance to curse your enemies with darkness, stun, freeze, or slow for 4 seconds. Level 6: MP Cost: 50, Buff Duration: 216 seconds. Has a 18% chance to curse your enemies with darkness, stun, freeze, or slow for 4 seconds. Level 7: MP Cost: 50, Buff Duration: 222 seconds. Has a 21% chance to curse your enemies with darkness, stun, freeze, or slow for 4 seconds. Level 8: MP Cost: 55, Buff Duration: 228 seconds. Has a 24% chance to curse your enemies with darkness, stun, freeze, or slow for 4 seconds. Level 9: MP Cost: 55, Buff Duration: 234 seconds. Has a 27% chance to curse your enemies with darkness, stun, freeze, or slow for 4 seconds. Level 10: MP Cost: 60, Buff Duration: 240 seconds. Has a 30% chance to curse your enemies with darkness, stun, freeze, or slow for 5 seconds. Description: Test your luck! Roll a dice to get a random buff. Roll 1: nothing, Roll 2: +30% physical defense, Roll 3: +20% hp and mp, Roll 4: +15% critical rate, Roll 5: +20% damage, and Roll 6: +30% experience. Level 1: MP Cost: 40, Duration: 66 seconds. Level 2: MP Cost: 40, Duration: 72 seconds. Level 3: MP Cost: 40, Duration: 78 seconds. Level 4: MP Cost: 40, Duration: 84 seconds. Level 5: MP Cost: 45, Duration: 90 seconds. Level 6: MP Cost: 45, Duration: 96 seconds. Level 7: MP Cost: 45, Duration: 102 seconds. Level 8: MP Cost: 45, Duration: 108 seconds. Level 9: MP Cost: 45, Duration: 114 seconds. Level 10: MP Cost: 50, Duration: 120 seconds. Level 11: MP Cost: 50, Duration: 126 seconds. Level 12: MP Cost: 50, Duration: 132 seconds. Level 13: MP Cost: 50, Duration: 138 seconds. Level 14: MP Cost: 50, Duration: 144 seconds. Level 15: MP Cost: 55, Duration: 150 seconds. Level 16: MP Cost: 55, Duration: 156 seconds. Level 17: MP Cost: 55, Duration: 162 seconds. Level 18: MP Cost: 55, Duration: 168 seconds. Level 19: MP Cost: 55, Duration: 174 seconds. Level 20: MP Cost: 60, Duration: 180 seconds. Description: Test your luck! Roll 2 dice at once to get a special buff. If you roll two of the same numbers, a more powerful buff will be applied. Level 1: MP Cost: 60, 10% chance of rolling two dice, Buff Duration: 184 seconds. Level 2: MP Cost: 60, 20% chance of rolling two dice, Buff Duration: 188 seconds. Level 3: MP Cost: 60, 30% chance of rolling two dice, Buff Duration: 192 seconds. Level 4: MP Cost: 60, 40% chance of rolling two dice, Buff Duration: 196 seconds. Level 5: MP Cost: 60, 50% chance of rolling two dice, Buff Duration: 200 seconds. Description: Enhances the Monkey Magic skill. Level 1: MP Cost: 60, Duration: 300 seconds, MaxHP +323, MaxMP +323, All Stats +25, Speed +11, Jump +6, Accuracy +163, Avoidability +163. Level 2: MP Cost: 60, Duration: 300 seconds, MaxHP +336, MaxMP +336, All Stats +26, Speed +11, Jump +6, Accuracy +166, Avoidability +166. Level 3: MP Cost: 60, Duration: 300 seconds, MaxHP +349, MaxMP +349, All Stats +26, Speed +11, Jump +6, Accuracy +169, Avoidability +169. Level 4: MP Cost: 60, Duration: 300 seconds, MaxHP +362, MaxMP +362, All Stats +27, Speed +11, Jump +6, Accuracy +172, Avoidability +172. Level 5: MP Cost: 60, Duration: 300 seconds, MaxHP +375, MaxMP +375, All Stats +27, Speed +11, Jump +6, Accuracy +175, Avoidability +175. Level 6: MP Cost: 60, Duration: 300 seconds, MaxHP +388, MaxMP +388, All Stats +28, Speed +11, Jump +6, Accuracy +178, Avoidability +178. Level 7: MP Cost: 65, Duration: 300 seconds, MaxHP +401, MaxMP +401, All Stats +28, Speed +12, Jump +7, Accuracy +181, Avoidability +181. Level 8: MP Cost: 65, Duration: 300 seconds, MaxHP +414, MaxMP +414, All Stats +29, Speed +12, Jump +7, Accuracy +184, Avoidability +184. Level 9: MP Cost: 65, Duration: 300 seconds, MaxHP +427, MaxMP +427, All Stats +29, Speed +12, Jump +7, Accuracy +187, Avoidability +187. Level 10: MP Cost: 65, Duration: 300 seconds, MaxHP +440, MaxMP +440, All Stats +30, Speed +12, Jump +7, Accuracy +190, Avoidability +190. Level 11: MP Cost: 65, Duration: 300 seconds, MaxHP +453, MaxMP +453, All Stats +30, Speed +12, Jump +7, Accuracy +193, Avoidability +193. Level 12: MP Cost: 65, Duration: 300 seconds, MaxHP +466, MaxMP +466, All Stats +31, Speed +12, Jump +7, Accuracy +196, Avoidability +196. Level 13: MP Cost: 70, Duration: 300 seconds, MaxHP +479, MaxMP +479, All Stats +31, Speed +13, Jump +8, Accuracy +199, Avoidability +199. Level 14: MP Cost: 70, Duration: 300 seconds, MaxHP +492, MaxMP +492, All Stats +32, Speed +13, Jump +8, Accuracy +202, Avoidability +202. Level 15: MP Cost: 70, Duration: 300 seconds, MaxHP +505, MaxMP +505, All Stats +32, Speed +13, Jump +8, Accuracy +205, Avoidability +205. Level 16: MP Cost: 70, Duration: 300 seconds, MaxHP +518, MaxMP +518, All Stats +33, Speed +13, Jump +8, Accuracy +208, Avoidability +208. Level 17: MP Cost: 70, Duration: 300 seconds, MaxHP +531, MaxMP +531, All Stats +33, Speed +13, Jump +8, Accuracy +211, Avoidability +211. Level 18: MP Cost: 70, Duration: 300 seconds, MaxHP +544, MaxMP +544, All Stats +34, Speed +13, Jump +8, Accuracy +214, Avoidability +214. Level 19: MP Cost: 75, Duration: 300 seconds, MaxHP +557, MaxMP +557, All Stats +34, Speed +14, Jump +9, Accuracy +217, Avoidability +217. Level 20: MP Cost: 75, Duration: 300 seconds, MaxHP +570, MaxMP +570, All Stats +35, Speed +14, Jump +9, Accuracy +220, Avoidability +220. Level 21: MP Cost: 75, Duration: 300 seconds, MaxHP +583, MaxMP +583, All Stats +35, Speed +14, Jump +9, Accuracy +223, Avoidability +223. Level 22: MP Cost: 75, Duration: 300 seconds, MaxHP +596, MaxMP +596, All Stats +36, Speed +14, Jump +9, Accuracy +226, Avoidability +226. Level 23: MP Cost: 75, Duration: 300 seconds, MaxHP +609, MaxMP +609, All Stats +36, Speed +14, Jump +9, Accuracy +229, Avoidability +229. Level 24: MP Cost: 75, Duration: 300 seconds, MaxHP +622, MaxMP +622, All Stats +37, Speed +14, Jump +9, Accuracy +232, Avoidability +232. Level 25: MP Cost: 80, Duration: 300 seconds, MaxHP +635, MaxMP +635, All Stats +37, Speed +15, Jump +10, Accuracy +235, Avoidability +235. Level 26: MP Cost: 80, Duration: 300 seconds, MaxHP +648, MaxMP +648, All Stats +38, Speed +15, Jump +10, Accuracy +238, Avoidability +238. Level 27: MP Cost: 80, Duration: 300 seconds, MaxHP +661, MaxMP +661, All Stats +38, Speed +15, Jump +10, Accuracy +241, Avoidability +241. Level 28: MP Cost: 80, Duration: 300 seconds, MaxHP +674, MaxMP +674, All Stats +39, Speed +15, Jump +10, Accuracy +244, Avoidability +244. Level 29: MP Cost: 80, Duration: 300 seconds, MaxHP +687, MaxMP +687, All Stats +39, Speed +15, Jump +10, Accuracy +247, Avoidability +247. Level 30: MP Cost: 80, Duration: 300 seconds, MaxHP +700, MaxMP +700, All Stats +40, Speed +15, Jump +10, Accuracy +250, Avoidability +250. Description: Extremely increases your cannon’s performance permanently. In addition, there’s a chance of ignoring the enemy’s defense when attacking. Level 1: Permanently increases your damage by 11%, Ignores 5% of monster’s DEF. Level 2: Permanently increases your damage by 12%, Ignores 6% of monster’s DEF. Level 3: Permanently increases your damage by 13%, Ignores 6% of monster’s DEF. Level 4: Permanently increases your damage by 14%, Ignores 7% of monster’s DEF. Level 5: Permanently increases your damage by 15%, Ignores 7% of monster’s DEF. Level 6: Permanently increases your damage by 16%, Ignores 8% of monster’s DEF. Level 7: Permanently increases your damage by 17%, Ignores 8% of monster’s DEF. Level 8: Permanently increases your damage by 18%, Ignores 9% of monster’s DEF. Level 9: Permanently increases your damage by 19%, Ignores 9% of monster’s DEF. Level 10: Permanently increases your damage by 20%, Ignores 10% of monster’s DEF. Level 11: Permanently increases your damage by 21%, Ignores 10% of monster’s DEF. Level 12: Permanently increases your damage by 22%, Ignores 11% of monster’s DEF. Level 13: Permanently increases your damage by 23%, Ignores 11% of monster’s DEF. Level 14: Permanently increases your damage by 24%, Ignores 12% of monster’s DEF. Level 15: Permanently increases your damage by 25%, Ignores 12% of monster’s DEF. Level 16: Permanently increases your damage by 26%, Ignores 13% of monster’s DEF. Level 17: Permanently increases your damage by 27%, Ignores 13% of monster’s DEF. Level 18: Permanently increases your damage by 28%, Ignores 14% of monster’s DEF. Level 19: Permanently increases your damage by 29%, Ignores 14% of monster’s DEF. Level 20: Permanently increases your damage by 30%, Ignores 15% of monster’s DEF. Level 21: Permanently increases your damage by 31%, Ignores 15% of monster’s DEF. Level 22: Permanently increases your damage by 32%, Ignores 16% of monster’s DEF. Level 23: Permanently increases your damage by 33%, Ignores 16% of monster’s DEF. Level 24: Permanently increases your damage by 34%, Ignores 17% of monster’s DEF. Level 25: Permanently increases your damage by 35%, Ignores 17% of monster’s DEF. Level 26: Permanently increases your damage by 36%, Ignores 18% of monster’s DEF. Level 27: Permanently increases your damage by 37%, Ignores 18% of monster’s DEF. Level 28: Permanently increases your damage by 38%, Ignores 19% of monster’s DEF. Level 29: Permanently increases your damage by 39%, Ignores 19% of monster’s DEF. Level 30: Permanently increases your damage by 40%, Ignores 20% of monster’s DEF. Description: Cannon launches a powerful attack to damage multiple enemies in front of you at once. Level 1: MP Cost: 50, Damage: 534%, Attacks up to 6 monsters 2 times. Level 2: MP Cost: 50, Damage: 538%, Attacks up to 6 monsters 2 times. Level 3: MP Cost: 50, Damage: 542%, Attacks up to 6 monsters 2 times. Level 4: MP Cost: 50, Damage: 546%, Attacks up to 6 monsters 2 times. Level 5: MP Cost: 50, Damage: 550%, Attacks up to 6 monsters 2 times. Level 6: MP Cost: 55, Damage: 554%, Attacks up to 6 monsters 2 times. Level 7: MP Cost: 55, Damage: 558%, Attacks up to 6 monsters 2 times. Level 8: MP Cost: 55, Damage: 562%, Attacks up to 6 monsters 2 times. Level 9: MP Cost: 55, Damage: 566%, Attacks up to 6 monsters 2 times. Level 10: MP Cost: 55, Damage: 570%, Attacks up to 6 monsters 2 times. Level 11: MP Cost: 55, Damage: 574%, Attacks up to 6 monsters 2 times. Level 12: MP Cost: 60, Damage: 578%, Attacks up to 6 monsters 2 times. Level 13: MP Cost: 60, Damage: 582%, Attacks up to 6 monsters 2 times. Level 14: MP Cost: 60, Damage: 586%, Attacks up to 6 monsters 2 times. Level 15: MP Cost: 60, Damage: 590%, Attacks up to 6 monsters 2 times. Level 16: MP Cost: 60, Damage: 594%, Attacks up to 6 monsters 2 times. Level 17: MP Cost: 60, Damage: 598%, Attacks up to 6 monsters 2 times. Level 18: MP Cost: 65, Damage: 602%, Attacks up to 6 monsters 2 times. Level 19: MP Cost: 65, Damage: 606%, Attacks up to 6 monsters 2 times. Level 20: MP Cost: 65, Damage: 610%, Attacks up to 6 monsters 2 times. Level 21: MP Cost: 65, Damage: 614%, Attacks up to 6 monsters 2 times. Level 22: MP Cost: 65, Damage: 618%, Attacks up to 6 monsters 2 times. Level 23: MP Cost: 65, Damage: 622%, Attacks up to 6 monsters 2 times. Level 24: MP Cost: 70, Damage: 626%, Attacks up to 6 monsters 2 times. Level 25: MP Cost: 70, Damage: 630%, Attacks up to 6 monsters 2 times. Level 26: MP Cost: 70, Damage: 634%, Attacks up to 6 monsters 2 times. Level 27: MP Cost: 70, Damage: 638%, Attacks up to 6 monsters 2 times. Level 28: MP Cost: 70, Damage: 642%, Attacks up to 6 monsters 2 times. Level 29: MP Cost: 70, Damage: 646%, Attacks up to 6 monsters 2 times. Level 30: MP Cost: 75, Damage: 650%, Attacks up to 6 monsters 2 times. Description: Call the battleship of Nautilus to attack multiple enemies at once a number of times. Level 1: MP Cost: 350, Damage: 404%, Attacks up to 15 monsters 3 times. Level 2: MP Cost: 350, Damage: 408%, Attacks up to 15 monsters 3 times. Level 3: MP Cost: 350, Damage: 412%, Attacks up to 15 monsters 3 times. Level 4: MP Cost: 350, Damage: 416%, Attacks up to 15 monsters 3 times. Level 5: MP Cost: 350, Damage: 420%, Attacks up to 15 monsters 3 times. Level 6: MP Cost: 350, Damage: 424%, Attacks up to 15 monsters 3 times. Level 7: MP Cost: 350, Damage: 428%, Attacks up to 15 monsters 3 times. Level 8: MP Cost: 350, Damage: 432%, Attacks up to 15 monsters 3 times. Level 9: MP Cost: 350, Damage: 436%, Attacks up to 15 monsters 3 times. Level 10: MP Cost: 350, Damage: 440%, Attacks up to 15 monsters 3 times. Level 11: MP Cost: 350, Damage: 444%, Attacks up to 15 monsters 3 times. Level 12: MP Cost: 350, Damage: 448%, Attacks up to 15 monsters 3 times. Level 13: MP Cost: 350, Damage: 452%, Attacks up to 15 monsters 3 times. Level 14: MP Cost: 350, Damage: 456%, Attacks up to 15 monsters 3 times. Level 15: MP Cost: 350, Damage: 460%, Attacks up to 15 monsters 3 times. Level 16: MP Cost: 350, Damage: 464%, Attacks up to 15 monsters 3 times. Level 17: MP Cost: 350, Damage: 468%, Attacks up to 15 monsters 3 times. Level 18: MP Cost: 350, Damage: 472%, Attacks up to 15 monsters 3 times. Level 19: MP Cost: 350, Damage: 476%, Attacks up to 15 monsters 3 times. Level 20: MP Cost: 350, Damage: 480%, Attacks up to 15 monsters 3 times. Level 21: MP Cost: 350, Damage: 484%, Attacks up to 15 monsters 3 times. Level 22: MP Cost: 350, Damage: 488%, Attacks up to 15 monsters 3 times. Level 23: MP Cost: 350, Damage: 492%, Attacks up to 15 monsters 3 times. Level 24: MP Cost: 350, Damage: 496%, Attacks up to 15 monsters 3 times. Level 25: MP Cost: 350, Damage: 500%, Attacks up to 15 monsters 3 times. Level 26: MP Cost: 350, Damage: 504%, Attacks up to 15 monsters 3 times. Level 27: MP Cost: 350, Damage: 508%, Attacks up to 15 monsters 3 times. Level 28: MP Cost: 350, Damage: 512%, Attacks up to 15 monsters 3 times. Level 29: MP Cost: 350, Damage: 516%, Attacks up to 15 monsters 3 times. Level 30: MP Cost: 350, Damage: 520%, Attacks up to 15 monsters 3 times. Description: Install anchors to generate a strong magnetic field. The magnetic field formed will consistently attack monsters in between the anchors. In addition, the anchors will blow and deal fatal damage. Level 1: MP Cost: 62, Duration: 6, Constant damage: 220%. When the anchors self-destruct, deals 508% damage. Level 2: MP Cost: 62, Duration: 7, Constant damage: 240%. When the anchors self-destruct, deals 516% damage. Level 3: MP Cost: 62, Duration: 8, Constant damage: 260%. When the anchors self-destruct, deals 524% damage. Level 4: MP Cost: 62, Duration: 9, Constant damage: 280%. When the anchors self-destruct, deals 532% damage. Level 5: MP Cost: 62, Duration: 10, Constant damage: 300%. When the anchors self-destruct, deals 540% damage. Level 6: MP Cost: 74, Duration: 11, Constant damage: 320%. When the anchors self-destruct, deals 548% damage. Level 7: MP Cost: 74, Duration: 12, Constant damage: 340%. When the anchors self-destruct, deals 556% damage. Level 8: MP Cost: 74, Duration: 13, Constant damage: 360%. When the anchors self-destruct, deals 564% damage. Level 9: MP Cost: 74, Duration: 14, Constant damage: 380%. When the anchors self-destruct, deals 572% damage. Level 10: MP Cost: 74, Duration: 15, Constant damage: 400%. When the anchors self-destruct, deals 580% damage. Level 11: MP Cost: 86, Duration: 16, Constant damage: 420%. When the anchors self-destruct, deals 588% damage. Level 12: MP Cost: 86, Duration: 17, Constant damage: 440%. When the anchors self-destruct, deals 596% damage. Level 13: MP Cost: 86, Duration: 18, Constant damage: 460%. When the anchors self-destruct, deals 604% damage. Level 14: MP Cost: 86, Duration: 19, Constant damage: 480%. When the anchors self-destruct, deals 612% damage. Level 15: MP Cost: 86, Duration: 20, Constant damage: 500%. When the anchors self-destruct, deals 620% damage. Description: Summon your monkey’s elite twin to help in fighting enemies. Level 1: MP Cost: 40, Duration: 32, Damage: 280%. Level 2: MP Cost: 40, Duration: 34, Damage: 285%. Level 3: MP Cost: 40, Duration: 36, Damage: 290%. Level 4: MP Cost: 40, Duration: 38, Damage: 295%. Level 5: MP Cost: 50, Duration: 40, Damage: 300%. Level 6: MP Cost: 50, Duration: 42, Damage: 305%. Level 7: MP Cost: 50, Duration: 44, Damage: 310%. Level 8: MP Cost: 50, Duration: 46, Damage: 315%. Level 9: MP Cost: 50, Duration: 48, Damage: 320%. Level 10: MP Cost: 60, Duration: 50, Damage: 325%. Level 11: MP Cost: 60, Duration: 52, Damage: 330%. Level 12: MP Cost: 60, Duration: 54, Damage: 335%. Level 13: MP Cost: 60, Duration: 56, Damage: 340%. Level 14: MP Cost: 60, Duration: 58, Damage: 345%. Level 15: MP Cost: 70, Duration: 60, Damage: 350%. Level 1: MP Cost: 10, All Stats: +1%, Duration: 30 sec. Level 2: MP Cost: 10, All Stats: +1%, Duration: 60 sec. Level 3: MP Cost: 10, All Stats: +2%, Duration: 90 sec. Level 4: MP Cost: 10, All Stats: +2%, Duration: 120 sec. Level 5: MP Cost: 20, All Stats: +3%, Duration: 150 sec. Level 6: MP Cost: 20, All Stats: +3%, Duration: 180 sec. Level 7: MP Cost: 20, All Stats: +4%, Duration: 210 sec. Level 8: MP Cost: 20, All Stats: +4%, Duration: 240 sec. Level 9: MP Cost: 20, All Stats: +5%, Duration: 270 sec. Level 10: MP Cost: 30, All Stats: +5%, Duration: 300 sec. Level 11: MP Cost: 30, All Stats: +6%, Duration: 330 sec. Level 12: MP Cost: 30, All Stats: +6%, Duration: 360 sec. Level 13: MP Cost: 30, All Stats: +7%, Duration: 390 sec. Level 14: MP Cost: 30, All Stats: +7%, Duration: 420 sec. Level 15: MP Cost: 40, All Stats: +8%, Duration: 450 sec. Level 16: MP Cost: 40, All Stats: +8%, Duration: 480 sec. Level 17: MP Cost: 40, All Stats: +9%, Duration: 510 sec. Level 18: MP Cost: 40, All Stats: +9%, Duration: 540 sec. Level 19: MP Cost: 40, All Stats: +10%, Duration: 570 sec. Level 20: MP Cost: 50, All Stats: +10%, Duration: 600 sec. Level 21: MP Cost: 50, All Stats: +11%, Duration: 630 sec. Level 22: MP Cost: 50, All Stats: +11%, Duration: 660 sec. Level 23: MP Cost: 50, All Stats: +12%, Duration: 690 sec. Level 24: MP Cost: 50, All Stats: +12%, Duration: 720 sec. Level 25: MP Cost: 60, All Stats: +13%, Duration: 750 sec. Level 26: MP Cost: 60, All Stats: +13%, Duration: 780 sec. Level 27: MP Cost: 60, All Stats: +14%, Duration: 810 sec. Level 28: MP Cost: 60, All Stats: +14%, Duration: 840 sec. Level 29: MP Cost: 60, All Stats: +15%, Duration: 870 sec. Level 30: MP Cost: 70, All Stats: +15%, Duration: 900 sec. Level 1: MP Cost: 30, Cooldown: 600 sec. Level 2: MP Cost: 30, Cooldown: 540 sec. Level 3: MP Cost: 30, Cooldown: 480 sec. Level 4: MP Cost: 30, Cooldown: 420 sec. Level 5: MP Cost: 30, Cooldown: 360 sec. Description: Permanently increases the chance of granting addition damage after an attack. Also, when using this skill, the enemies’ attacks will not hold you back. Level 1: Active Effects: MP Cost 50, Duration: 10, 22% chance to not get knocked back by the enemy’s attack. Passive Effects: Permanent 1% chance of granting additional damage after attacking. Level 2: Active Effects: MP Cost 50, Duration: 20, 24% chance to not get knocked back by the enemy’s attack. Level 3: Active Effects: MP Cost 50, Duration: 30, 26% chance to not get knocked back by the enemy’s attack. Passive Effects: Permanent 2% chance of granting additional damage after attacking. Level 4: Active Effects: MP Cost 50, Duration: 40, 28% chance to not get knocked back by the enemy’s attack. Level 5: Active Effects: MP Cost 55, Duration: 50, 30% chance to not get knocked back by the enemy’s attack. Passive Effects: Permanent 3% chance of granting additional damage after attacking. Level 6: Active Effects: MP Cost 55, Duration: 60, 32% chance to not get knocked back by the enemy’s attack. Level 7: Active Effects: MP Cost 55, Duration: 70, 34% chance to not get knocked back by the enemy’s attack. Passive Effects: Permanent 4% chance of granting additional damage after attacking. Level 8: Active Effects: MP Cost 55, Duration: 80, 36% chance to not get knocked back by the enemy’s attack. Level 9: Active Effects: MP Cost 55, Duration: 90, 38% chance to not get knocked back by the enemy’s attack. Passive Effects: Permanent 5% chance of granting additional damage after attacking. Level 10: Active Effects: MP Cost 60, Duration: 100, 40% chance to not get knocked back by the enemy’s attack. Level 11: Active Effects: MP Cost 60, Duration: 110, 42% chance to not get knocked back by the enemy’s attack. Passive Effects: Permanent 6% chance of granting additional damage after attacking. Level 12: Active Effects: MP Cost 60, Duration: 120, 44% chance to not get knocked back by the enemy’s attack. Level 13: Active Effects: MP Cost 60, Duration: 130, 46% chance to not get knocked back by the enemy’s attack. Passive Effects: Permanent 7% chance of granting additional damage after attacking. Level 14: Active Effects: MP Cost 60, Duration: 140, 48% chance to not get knocked back by the enemy’s attack. Level 15: Active Effects: MP Cost 65, Duration: 150, 50% chance to not get knocked back by the enemy’s attack. Passive Effects: Permanent 8% chance of granting additional damage after attacking. Level 16: Active Effects: MP Cost 65, Duration: 160, 52% chance to not get knocked back by the enemy’s attack. Level 17: Active Effects: MP Cost 65, Duration: 170, 54% chance to not get knocked back by the enemy’s attack. Passive Effects: Permanent 9% chance of granting additional damage after attacking. Level 18: Active Effects: MP Cost 65, Duration: 180, 56% chance to not get knocked back by the enemy’s attack. Level 19: Active Effects: MP Cost 65, Duration: 190, 58% chance to not get knocked back by the enemy’s attack. Passive Effects: Permanent 10% chance of granting additional damage after attacking. Level 20: Active Effects: MP Cost 70, Duration: 200, 60% chance to not get knocked back by the enemy’s attack. Level 21: Active Effects: MP Cost 70, Duration: 210, 62% chance to not get knocked back by the enemy’s attack. Passive Effects: Permanent 11% chance of granting additional damage after attacking. Level 22: Active Effects: MP Cost 70, Duration: 220, 64% chance to not get knocked back by the enemy’s attack. Level 23: Active Effects: MP Cost 70, Duration: 230, 66% chance to not get knocked back by the enemy’s attack. Passive Effects: Permanent 12% chance of granting additional damage after attacking. Level 24: Active Effects: MP Cost 70, Duration: 240, 68% chance to not get knocked back by the enemy’s attack. Level 25: Active Effects: MP Cost 75, Duration: 250, 70% chance to not get knocked back by the enemy’s attack. Passive Effects: Permanent 13% chance of granting additional damage after attacking. Level 26: Active Effects: MP Cost 75, Duration: 260, 72% chance to not get knocked back by the enemy’s attack. Level 27: Active Effects: MP Cost 75, Duration: 270, 74% chance to not get knocked back by the enemy’s attack. Passive Effects: Permanent 14% chance of granting additional damage after attacking. Level 28: Active Effects: MP Cost 75, Duration: 280, 76% chance to not get knocked back by the enemy’s attack. Level 29: Active Effects: MP Cost 75, Duration: 290, 78% chance to not get knocked back by the enemy’s attack. Passive Effects: Permanent 15% chance of granting additional damage after attacking. Level 30: Active Effects: MP Cost 80, Duration: 300, 80% chance to not get knocked back by the enemy’s attack. Description: Fires the enemies in front of you. Level 1: MP Cost: 45, Damage: 218%, Attacks the enemy 5 times, 1% Critical Chance will be added. Level 2: MP Cost: 45, Damage: 221%, Attacks the enemy 5 times, 1% Critical Chance will be added. Level 3: MP Cost: 45, Damage: 224%, Attacks the enemy 5 times, 2% Critical Chance will be added. Level 4: MP Cost: 45, Damage: 227%, Attacks the enemy 5 times, 2% Critical Chance will be added. Level 5: MP Cost: 48, Damage: 230%, Attacks the enemy 5 times, 3% Critical Chance will be added. Level 6: MP Cost: 48, Damage: 233%, Attacks the enemy 5 times, 3% Critical Chance will be added. Level 7: MP Cost: 48, Damage: 236%, Attacks the enemy 5 times, 4% Critical Chance will be added. Level 8: MP Cost: 48, Damage: 239%, Attacks the enemy 5 times, 4% Critical Chance will be added. Level 9: MP Cost: 48, Damage: 242%, Attacks the enemy 5 times, 5% Critical Chance will be added. Level 10: MP Cost: 51, Damage: 245%, Attacks the enemy 5 times, 5% Critical Chance will be added. Level 11: MP Cost: 51, Damage: 248%, Attacks the enemy 5 times, 6% Critical Chance will be added. Level 12: MP Cost: 51, Damage: 251%, Attacks the enemy 5 times, 6% Critical Chance will be added. Level 13: MP Cost: 51, Damage: 254%, Attacks the enemy 5 times, 7% Critical Chance will be added. Level 14: MP Cost: 51, Damage: 257%, Attacks the enemy 5 times, 7% Critical Chance will be added. Level 15: MP Cost: 54, Damage: 260%, Attacks the enemy 5 times, 8% Critical Chance will be added. Level 16: MP Cost: 54, Damage: 263%, Attacks the enemy 5 times, 8% Critical Chance will be added. Level 17: MP Cost: 54, Damage: 266%, Attacks the enemy 5 times, 9% Critical Chance will be added. Level 18: MP Cost: 54, Damage: 269%, Attacks the enemy 5 times, 9% Critical Chance will be added. Level 19: MP Cost: 54, Damage: 272%, Attacks the enemy 5 times, 10% Critical Chance will be added. Level 20: MP Cost: 57, Damage: 275%, Attacks the enemy 5 times, 10% Critical Chance will be added. Level 21: MP Cost: 57, Damage: 278%, Attacks the enemy 5 times, 11% Critical Chance will be added. Level 22: MP Cost: 57, Damage: 281%, Attacks the enemy 5 times, 11% Critical Chance will be added. Level 23: MP Cost: 57, Damage: 284%, Attacks the enemy 5 times, 12% Critical Chance will be added. Level 24: MP Cost: 57, Damage: 287%, Attacks the enemy 5 times, 12% Critical Chance will be added. Level 25: MP Cost: 60, Damage: 290%, Attacks the enemy 5 times, 13% Critical Chance will be added. Level 26: MP Cost: 60, Damage: 293%, Attacks the enemy 5 times, 13% Critical Chance will be added. Level 27: MP Cost: 60, Damage: 296%, Attacks the enemy 5 times, 14% Critical Chance will be added. Level 28: MP Cost: 60, Damage: 299%, Attacks the enemy 5 times, 14% Critical Chance will be added. Level 29: MP Cost: 60, Damage: 302%, Attacks the enemy 5 times, 15% Critical Chance will be added. Level 30: MP Cost: 63, Damage: 305%, Attacks the enemy 5 times, 15% Critical Chance will be added. It’s funny… Some of the Mastery Books have a different icon, for example the first one… Don’t be tricked if you see an icon for a 3rd job skill while it isn’t. Remember that everything here is a 4th job skill for this class. Now this is weird, there are the following Mastery Books as well, which work 100% of the time and jump from level 5 to that desired level (which is 30). Same thing as the Jump! events… Do I smell another event? That’s all for now! I’m so excited!!! Speaking of polls, I reviewed the answers from the previous one. Most of you asked for a new theme with a logo. I already got a sick idea for the logo, but now the problem is the theme. WordPress.com doesn’t give you anything -_-“… I’ll try my best to find one with a logo, though. So sick of Google Translate now… SO MUCH TRANSLATIONS!!! Not to mention a 40 stat skill and MW ! You can’t add a new job in a Private Server. Proof: Me experience in WZ Editing. That was because it was already in the data. That was already in the WZ in v.56. But it is possible to add a new job to a private server. In fact, I added pirates to a v.55 private server once. It did require doing a lot of different things, but if I truly put my mind to this, I might be able to. Thank you for this guide. I love pirates and I am really excited for this class. I assumed that dex would be their main. Im a lil disappointed most my % str is worrior only where as my dex is common/pirate owell guess i got work to do. Actually, read the background section or look at any of the cannons; primary stat is STR! wow they get 70 all stats and some decent skills . Any PS with Cannon Shooters? Nope, but I might make one. Yep you’re right. For some reason, every time there’s a date anywhere I assume it’s the sixth. That’s not exactly what I meant, I meant I’ll create a source with that job in it. I can’t exactly host it with no server, so you’ll have to join someone else’s. I think making a p.server with KMS content is really cool!! How long would it take to make such a p.server? It wouldn’t take too long to just add this job. However, to be honest, I’m kind of scared of doing so. Think you might get in trouble with Korean Laws for accessing their files?? 1) You are much more popular than me, I probably only have a couple of visitors. 2) Even though I DID get the theme before you, now everyone might kill me for having the same theme. DAMN IT. Oh… Sorry… I just Google’d my old theme, ‘Greyzed’ and read about this theme and decided to try it out. But don’t worry, you’re not ‘unoriginal,’ it’s just a WordPress theme. In addition, I don’t think my blog is more popular than yours. Our blogs don’t look alike also^^, I have the big whale on the side lol-> while you don’t. If you copy THAT, then it’s unoriginal. It looks like Cannon Shooter is going to be an interesting class. It also has some skills that gives free stats, which means low DEX Cannon Shooter is the way to go. It’s already enough for Cannon Shooters to arm Dragon Hertz, a level 110 cannon which requires 110 DEX, without wearing any DEX equips, though people aren’t going to max Hyper Monkey Magic first in 4th Job. After Cannon Shooters get 110 DEX with all those stat skills, they just need 60 more DEX to use Shark Tooth Flam, the strongest cannon that requires 170 DEX. Im sure those two MonM wont stack. Okay, then Cannon Shooters get 90 with all those stat skills. Still it’s enough for Cannon Shooters to arm Alvaro, a level 90 cannon, without wearing any DEX equips. Arrol, he’s not referring to Monkey Magic and Hyper Monkey Magic being stackable. You can get at least 70 DEX with the skills and the base stat, then you’ll get 20 more DEX from Hyper Monkey Magic at late 4th job. Yep, I mean, getting that 40 DEX in 4th job will take a really long time, might not even make it. Everything is stackable and yes if you’re 130ish your DEX will probably be sufficient, but then again until you reach that level it isn’t. Still it’s enough for Cannon Shooters to arm Alvaro, a level 90 cannon, without wearing any DEX equips. Low DEX Cannon Shooters are still the best way to go. Sorry for double post, since I had to edit my comment out. you do a very nice job man! thanks for the updates! They share, they don’t have their own. They are Adventurers. Just a suggestion, I think it would look better if the animations were put right after the name and before the skill details. what are the jobnames of cannon shooters in english? if you do make the PS i would be soooooooooooooooooooooooooooo happy!!!!!!!!!!!!! !